Beth White gave her heart to immortal Kahtar Constantine and joined his clan. She discovers happily ever after is a myth even in the charming village of Willowyth. Cultuelle Khristos accepted Beth into the clan before discovering she had seeker blood. They can't see past it. Beth can't see past the truth, but no one wants to hear it--and Kahtar is caught in the middle. When the clan's Warriors of ilu vote to shun Beth, Kahtar must choose between centuries of unyielding duty and his heart. In FOREVER The Constantines' Secret Kahtar comes full circle as the truth and his past unexpectedly catch up with him, and forever change his future. Writing this book was one long labor and delivery process. It felt like FOREVER. That's because when it comes to novel writing I can be a bit of a perfectionist (and so can my editor). It was a BLAST to hang out with Kahtar and Beth again. I love their relationship. Kahtar, ancient immortal warrior with plenty of secrets and Beth, painfully-honest business woman--it's a volatile mix. 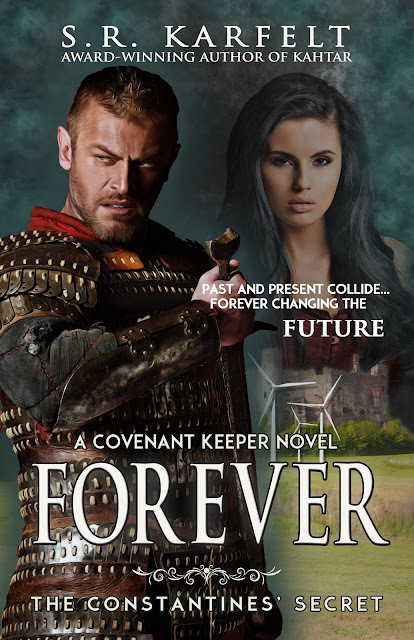 If you've read other Covenant Keeper Novels, you'll know right off that the woman on that cover isn't Beth. So, who is it? Well, you'll have to read the book to get the answer to that question. It's been an exciting week with FOREVER making its appearance and KAHTAR Warrior of the Ages getting some recognition. KAHTAR is a finalist in the USA Book News 2015 USA Best Book Awards in the Fiction Cross-Genre category. You can check that out here and here! (Scroll down until you recognize Kahtar)! Since writing is one of my favorite things to do on earth, my next book is already nearing completion. Actually the next two books are. In the meantime enjoy FOREVER The Constantines' Secret!